Ever since I started playing games online, shooters have always held as the preferred way for teams of competitive gamers to face off on equal terms. Nearly a decade later, I still continue to jump to the next big thing in the shooter genre, hoping to find that slightly more enjoyable experience while satiating my need for rising competitive ladders. Around PAX Prime of last year, Dirty Bomb caught my eye, as the next potential member of the e-sports scene. If you look past the publisher tag (Nexon), you’ll notice this game comes from quite the seasoned set of veterans at Splash Damge, successful map makers in Return To Castle Wolfenstein, as well as developers of Wolfenstein: Enemy Territory, and later the less successful Enemy Territory: Quake Wars. And all of these games had one thing in common, they were successful e-sport titles. Since the closed beta began earlier this year I have been playing Dirty Bomb on and off. I can’t recall the last time I saw a shooter go through such drastic changes to meet player feedback while upping quality to the developer’s standards. Overall decisions seem to be heading in the right direction, with regular patches slowly shaping Dirty Bomb up into quite the stand out shooter. Before I delve into the details, I want to focus on the business model and what we know so far. Those that played the early beta will barely recognize Dirty Bomb as it is now. This game is obviously going to be free-to-play (read: Nexon) which is just simply amazing for a shooter of this quality. From what I’ve read and seen in beta, the primary way the game will fund is through a store selling mercenaries for real money. 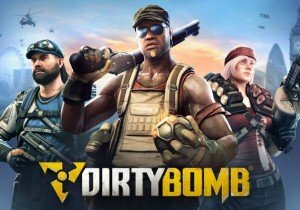 Similar to games such as League of Legends where you can unlock a champion with either game money or real money, Dirty Bomb will take the same route but takes it a step further. As of yet there aren’t necessarily skins available to buy, but you are able to get them as a different load out card. For the mercenaries in the game, you will be able to receive different load out cards by opening cases. You can also find these cards in the store itself, but these cards you buy individually generally aren’t the best you can get. Since these cards have different qualities, each card has different bonuses and even different weapons or knives that they can use. These bonuses can range from faster reloading speed, to anything else that will drastically help out your play. The weapons also range for each mercenary card. And these cases can, as you’d expect, be bought with real money or in game money. The pricing on cases is relatively cheap compared to other gacha boxes that free to play games tend to offer, meaning spenders won’t be too phased to open a few a day. No key is required either to open them (take notes Valve) and thus the players that choose to go completely free to play aren’t left behind the pack. Although you must have a little bit of luck on your side, as the RNG can be against you if you are not very lucky in life. Well that’s enough on the monetization system; let’s talk gameplay. Just like the previous games Splash Damage is known for, Dirty Bomb moves at a much faster pace than the standard. And the guns don’t really have too much of a recoil, rewarding long range snipes as well as run and gun gameplay. Even with a SMG from across the map you can be successful and land headshots left and right. As such, misdirection is the name of the game since whoever gets their line of sight on an unwary enemy first is going to win the day. Thus you’ll need to trust your teammates with your life in nearly every match, hoping their suppression fire keeps your head on your shoulders longer than your foe’s! Modes are limited, but the gameplay keeps them fresh. Dirty Bomb is all about not getting caught, and clearing the objectives in the best possible way to get you the fastest win. Every minute a match goes on increases the chance of your enemies popping a few lucky shots to claim victory. This is where planning comes in, as you need to know exactly what each mercenary in your team excels at to get the most bang for the bullet as a whole. For instance, each mercenary has a different type of running speed, and since I like to be fast, I regularly play the SMG type of mercenaries that outpace the competition in a foot race. The more agile your mercenary in Dirty Bomb, the better you can parkour over objects and wide gaps to double jump your way to higher positions on a map. Although the map isn’t necessarily made for this, you can still get on some nifty spits to surprise your enemies from angles they didn’t think were possible to camp from. As of right now there are only two game modes that you can play. The first being Objective, that as the name might suggest is all about getting the objectives to secure the win. And the other one is Stopwatch, which is basically the same but you will have to clear the objectives in the fastest time and then you will switch sides with the enemy team. The fastest team obviously wins and this game mode in particular is also played in a competitive mode. There is however a game mode called ‘Execution’ in the making that is going to cater to the people that simply want to focus on a kill or be killed team arena setting. Besides the running and gunning, each mercenary has their own set of tools to change the battlefield drastically. This ranges from health and ammo refills, to more complex mechanics like a heartbeat sensor. Artillery Mercs are a bit tougher to master, but can feed your team some truly decisive victories when done well. As a run and gun twitch player though, this type of gameplay detracts from the overall experience. I don’t mind healing, or a well-placed heartbeat sensor that reverses the element of surprise. These utilities take timing and skill along with proper teamwork to utilize. But artillery, laser beams from the sky and other deadly shenanigans totally defeat the purpose of skill, bringing the outcome a little closer the side of luck versus skill. Randomly exploding happens often, and is not at all satisfying. One artillery strike can totally wipe out the enemy team, especially since some of the map requires small ally’s as passageways to the larger areas. And thus one well-placed artillery strike at the right moment can kill your whole team or at least a majority of them. In such a fast-paced game, getting the majority of your crew on sudden respawn timers is enough to turn the tides. These powerful blasts do not even require killstreaks; right from the get-go you can use them. Splash Damage thus far has tried to balance these with cooldown timers, but this timer is pretty low compared to the sheer chaos these skills can unleash. Thus randomly exploding is a common occurrence in Dirty Bomb. Dirty Bomb brings elements from all sorts of games into their own project and does it well up to a degree. They truly define the free-to-play genre and show the rest of the industry that you can easily let people enjoy the game without making them pay a ton of money to enjoy most of the content. Although the price of a mercenary can be quite steep, and it doesn’t even give you the best load out cards for that mercenary, it is mainly their only source of income, unless you decide to buy cases for cards of course. But everything seems to be purchaseable by earning it in-game, so I can’t really knock them for trying to incentivize at least part of the population to spending real cash to rush unlocks. The gameplay, despite some of the abilities, is simply put: awesome. I really enjoy playing this game and with the right team play the game is very enjoying. Losing three plus hours without realizing it is the norm when signing in here. The title clearly carries a high skill ceiling, so even shooter veterans can look forward to jumping in and getting their asses handed to them for a few rounds before adjusting. If you are a fan of online team shooters, then Dirty Bomb is a can’t miss game in 2015.